You know how it is. That special event just around the corner and you can't fit into your designer jeans. You need a fool-proof, emergency weight-loss method that really works and works fast. So how do you safely and quickly lose those extra pounds? Once again, renowned health pioneer and bestselling author Ann Louise Gittleman has a quick, no-strings-attached solution that is also good for you. 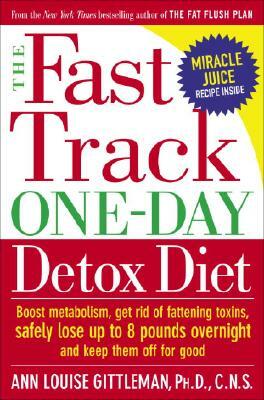 She is always on the cutting edge of developing new methods to rejuvenate the body and facilitate weight loss and she's done it again in "The Fast Track One-Day Detox Diet." Gittleman takes the age-old method of fasting and incorporates it into a safe and healthy one-day plan that helps you lose weight fast, gets rid of toxins, and gives your body a cleansing boost to prepare it for even more weight loss down the road. That's all. There's no need for a strict maintenance plan or more dieting because the Fast Track One-Day Detox Diet" "purges your body of fattening toxins so that you'll keep losing weight once you're finished. What's more, if you can't add those healthy foods to your diet in the Prequel and Sequel, Gittleman provides a list of replacementsupplements that you can easily find in your local health food store or online. So, use "The Fast Track One-Day Detox Diet" to jump start an over-40 metabolism, melt away vacation or holiday pounds, break a diet plateau, get in shape for that high school reunion or wedding, and even help heal a chronic illness. Even if you've been slow to lose weight in the past, the pounds will melt away quickly during your one-day fast. Inside there are recipes to prepare for the fast, shopping lists, and tips for sailing through the fast. In addition, Ann Louise Gittleman shares the wisdom she's gained from years of research on health, diet, and nutrition. You'll find out about hidden toxins found in the environment and in everyday foods, and learn easy steps you can take to live healthier every day. The perfect diet: simplicity, effortless weight loss, and obvious health benefits from a nutritionist with a proven tack record. You'll feel so good after your first fast, you'll want to incorporate the Fast Track's cleansing principles and periodic fasting into your life for good." "Don't delay, it's time to jump on the Fast Track to a lighter, healthier you.